MINN is excited to welcome USAID's Eric Postel, Assistant Administrator for the Bureau of Economic Growth, Education and Environment. 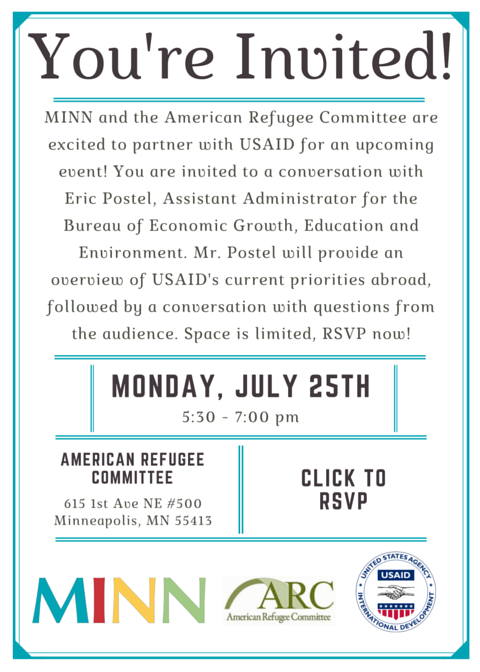 Mr. Postel will provide an overview of USAID's current priorities abroad, followed by a conversation with questions from the audience. Eric G. Postel was confirmed by the U.S. Senate in March 2011 as Assistant Administrator for the Bureau of Economic Growth, Education and Environment. Since May 2015, he has also served concurrently as Associate Administrator. Mr. Postel brings to the position more than 25 years of private sector experience working in emerging markets. Mr. Postel also serves as the Agency’s coordinator for the government-wide Partnership for Growth program and the "Plus 1" (alternate director) to the Millennium Challenge Corporation. From October 2014 to December 2015, he also served as the Assistant to the Administrator to Africa. Mr. Postel is the founder of Pangaea Partners, an investment banking and consulting firm focused on emerging markets. Its accomplishments include helping six African countries create or improve their stock markets, providing credit and treasury courses to more than 30,000 bankers in developing countries, modernizing more than 20 former Soviet banks, and advising on the creation of the Slovak Export-Import Bank. Throughout 2006-7, Mr. Postel served as a Senate-appointed commissioner of the U.S. Helping to Enhance the Livelihood of People around the Globe (HELP) Commission. His bipartisan work contributed to the development of a wide-ranging set of recommendations to Congress and the president for the reform of U.S. foreign assistance programs. Previously, Mr. Postel worked as a vice president at Citibank Tokyo, where he arranged financing for borrowers on four continents. This work included arranging the first ever financing for new Boeing aircraft in Zimbabwe, serving as Bangladesh’s first-ever financial advisor and arranging India’s first-ever Japanese tax-lease financing. In 1988, Mr. Postel devised a $30 million financing for Jamaica International Telecommunications Limited (JAMINTEL) from Japanese investors which was the first international securitization of future receivables without a corporate guaranty – this structure has subsequently served as the basis of more than $80 billion worth of financings. Mr. Postel has a BA from Wesleyan University and an MBA from Stanford University. Between Wesleyan and Stanford, he served as a United States Naval Officer.